I am glad to inform you that padhuskitchen has completed 1 year today. What started as a hobby has become a passion now. When I receive comments or mails or when people come and tell me that they followed my recipes and it turned out well, I feel so happy. Rice kheer is a very famous Indian dessert which is very simple to prepare. Heat a tsp of ghee and fry cashew nuts and raisins. Soak almonds in hot water, peel the skin and cut it into thin slices. Boil milk and add the soaked rice (drain the water) to the milk. Cook rice in the milk on low flames stirring it frequently so that it doesn't get burnt. When rice is cooked, mash it slightly with the ladle, then add sugar. When sugar dissolves, add cardamom powder, cashew nuts, raisins and almonds. Rice kheer is ready to be served hot or cold. Sounds so easy isn't it? In my house everybody prefers it cold, so I usually refrigerate it when it cools down. Happy blog anniversary dear.. Rice Kheer looks fabulous even though is very easy to make. Wish u all the very best for the upcoming years.. You have come all the way though bringing delightful recipes which are eye catchy. Congratulations on your 1st blog birthday.Wish to see many more such blog birthdays with 1000's of delicious recipes.Rice kheer looks very deliicous.Nice presentation. Congratulations on your blog aniversery Padhu. Pasyasam looks delicious. Congrats on ur one year completion.. The payasam looks delicious. Congrats dear on ur blog anniversary...happy blogging...nice recipe to celebrate with. Hey,congrats dear.Rice payasam is my fav.looks so yummy. Happy bloggy bday padhu..Great payasam, Congrats..
Congrats Padhu on your blog anniversary! congrats on your blog anniversary! payasam looks yummm! Congrats dear on ur blog anniversary, keep going..Kheer looks fantastic, rich and creamy..
congrats on ur blog anniversary padhu. wish ur blog celebrate more anniversaries. Congrats on ur blog anniversary padhu,the kheer luks delicious...perfect menu for the celebration. congrats padhu , i love this payasam. Congratulations on the Anniversary! 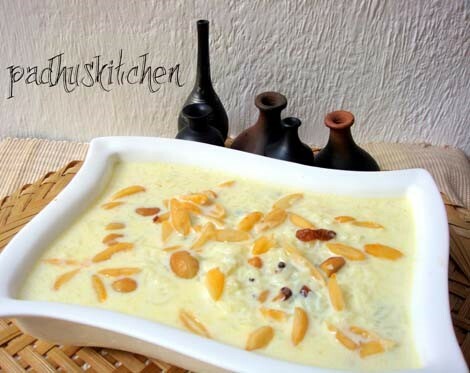 Rice kheer is so apt for the occasion! Cheers! 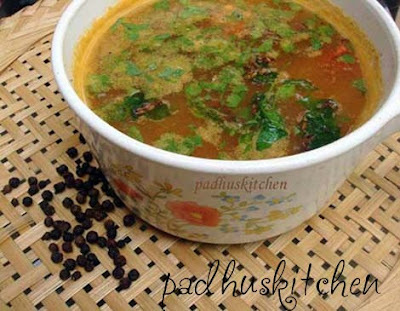 Congrats Padhu..kheer looks so delicious, rich and creamy..and loved your first post,rasam too..both looks yummy. congrats on your 1st anniversary. payasam looks so delicious.. as usual nice presentaion..
Congrats dear.. loved the payasam .. great presentation!! Congrats on completing one year, Padhu..Loved your delicious rice payasam.. The Kheer looks yummy. can eat it anytime!! Congratulations on blogs birthday. pdhu thats a grt news ur celebrating the anniversary.. grt job yarr.. keep going..
really delicious ari payasam. best for this wonderful occasion..
Congratulations on your 1 year anniversary! I recently started writing my own blog, and I fully enjoyed seeing all you have done in one year. I hope that I can follow your path! My daughter and I fully enjoyed perusing your posts and look forward to seeing your new ones. Congratulations Padhu !! Amazing blog..first time here..esp the HOW TO one's they ll really help a new cook :) Keep Rocking !! This recipe will serve 3-4 persons. So you have to calculate for 60 persons. You do not have to be very accurate. You can calculate approximately. Add sugar according to taste. Hi padhu such a great job u r doing u really deserve a royal salute. Step by step methods clear pictures helping like anything keep doing, keep rocking hearty wishes all the best. THANK YOU. Hello Padhu, I dont go to any other site for recipes other than yours. Your measurements are reliable and the results too. I have the confidence of making it right the first time itself. Hats off to you !! Hai Padhu Can i cook rice in cooker and then put in milk to prepare rice kheer? In that case, you have to reduce the milk.